Members of the so-called “thumb generation” are known for their skills with digital devices and surfing the Internet. But research shows college students struggle in the area of “information literacy,” or the ability to locate, understand, evaluate and use informational resources necessary for university-level coursework. The ease of Internet access to information such as advertisements, blogs, press releases, wikis, newspapers and encyclopedias makes it imperative that students are equipped to not only read and comprehend these materials but also to analyze multiple perspectives and evaluate source reliability. Now NIU is introducing a new course, Introduction to Library and Information Research (UNIV 105), that will provide students with information literacy skills. Taught by University Libraries faculty in smart classrooms, UNIV 105 is a one-credit elective course. Students will participate in hands-on class activities that promote active learning and critical thinking. Some slots are still available for the fall semester, and the course is expected to be offered during the spring semester as well. “This is a course that is designed for freshmen but will be useful to any student at NIU who would like to more effectively search for and find appropriate and credible sources,” says Nestor Osorio, head of reference and research for University Libraries and one of five library faculty members who spearheaded creation of the course. “Students who develop strong library research skills are more likely to improve their overall academic performance,” Osorio says. Osorio pointed to a recent study conducted by the Ethnographic Research in Illinois Academic Libraries project. 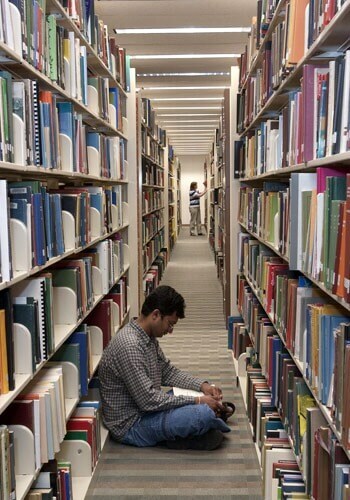 It found that despite being “born digital,” today’s undergraduates struggle with researching scholarly information. Further, they do not recognize their own limitations. Students reported that Google is their most regularly used search tool, but most did not know how to build a search or how to limit search results within it. Introduction to Library and Information Research will help seek students learn how to efficiently and effectively seek out information, conduct research and properly cite sources, with a special emphasis placed on the social value of quality information. The course includes a section on the legal and ethical uses of information. Creation of coursework was guided by the Association of College and Research Libraries’ (ACRL) Information Literacy Competencies for Higher Education, which are the national standards for academic libraries. Osorio said the course has been well received. Four sections are being offered this fall, including through collaborations with Themed Learning Communities (TLC), the Research Rookies program and the University Honors Program. One section is open to all students. More information on the course is available online or by contacting Osorio at nosorio@niu.edu or Wendell Johnson at wjohnso1@niu.edu.